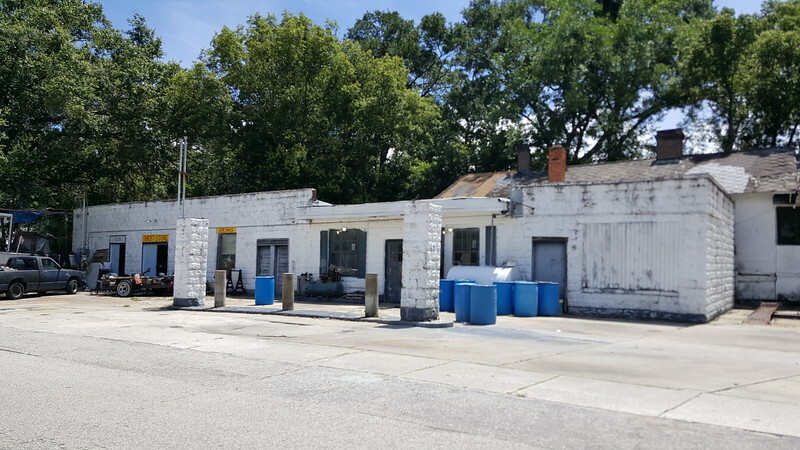 Gas stations may be one of our most common commercial building types and one of our most ignored. However, they may be one of our most valuable resources illustrating the evolution of our city during the 20th century. In the years following the Great Fire of 1901, Jacksonville mushroomed into a metropolis fueled by Florida’s largest streetcar network. Operated by the Jacksonville Traction Company, this system stretched 60 miles across the city, carrying as many as 13,828,904 passengers in 1912. However, by this time the wheels had already been set in motion for a new form of mobility that would radically change the built environment of the city. 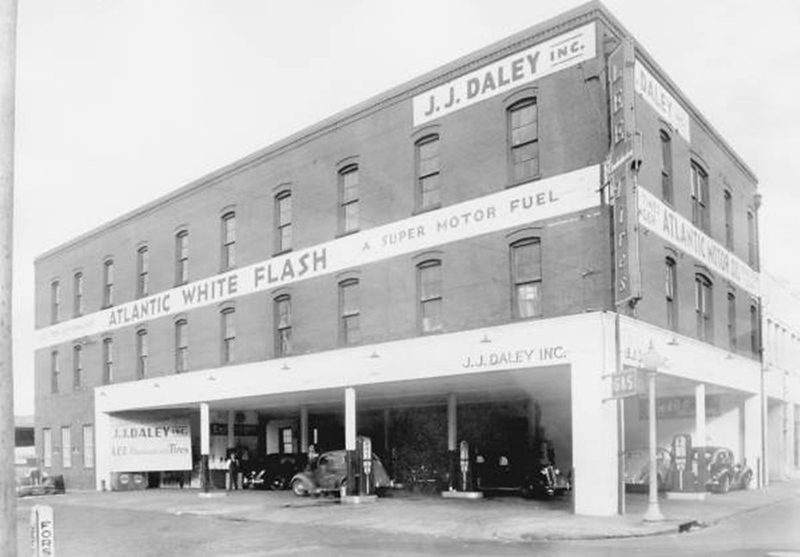 In 1905, the world’s first purpose-built gas station opened in St. Louis, MO. By the end of the decade, attempting to accommodate the increasing availability of automobiles locally, businesses such as automobile dealerships and hardware stores began installing curbside gas pumps in the front of their buildings. 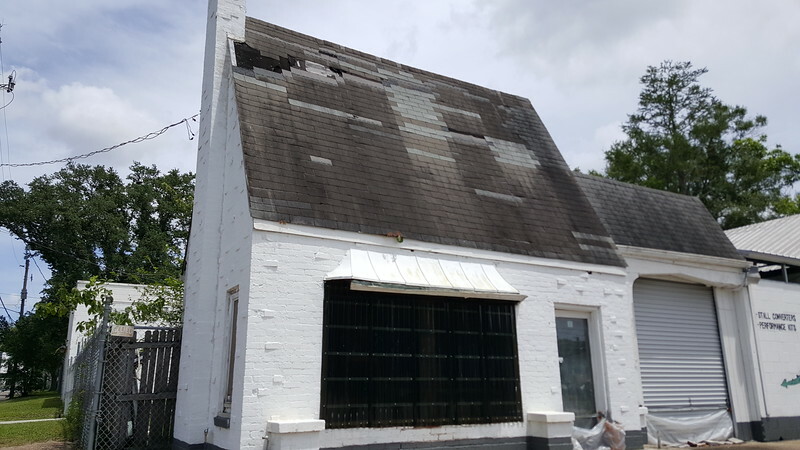 Built in 1906 as a carriage showroom, blacksmith shop, and horse stable for the McMurray Livery, Sale & Transfer Company at 220 East Forsyth, is an example of a structure that became one of the city’s first gas stations through the installation of curbside gas pumps. 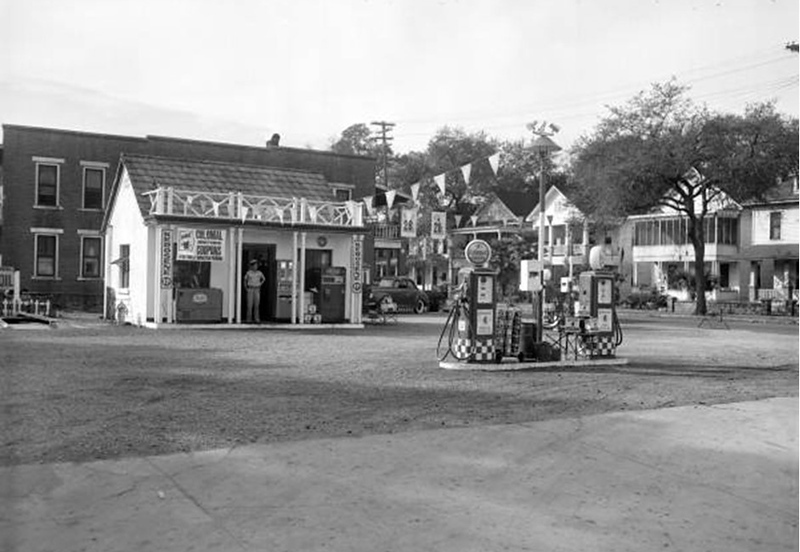 On December 1, 1913, the Gulf Refining Company opened the first “drive-in” filling station in Pittsburgh, PA. By the end of the decade, multiple use stations began to spring up in and around the area. 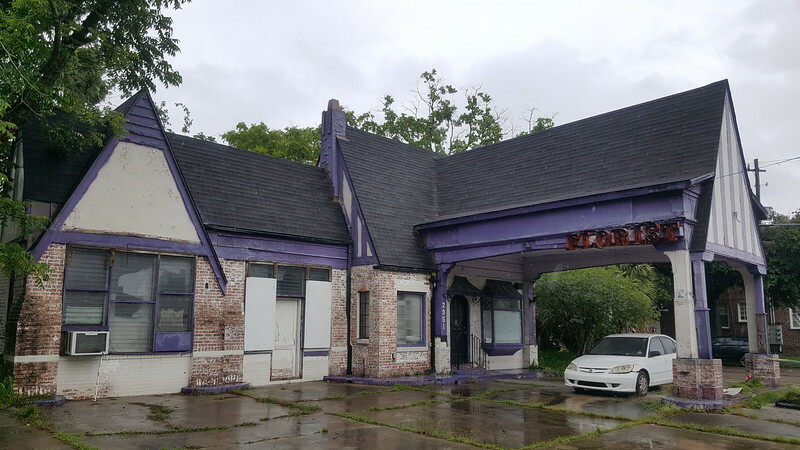 Better accommodating the automobile than earlier curbside stations, multiple-use stations were created by adding drive-in filling stations to businesses like repair garages, general stores, and restaurants. Completed in 1917, 7333 Buffalo Avenue in Panama Park is an example of an early multiple-use station that opened in what was then a rural community five miles north of Jacksonville. 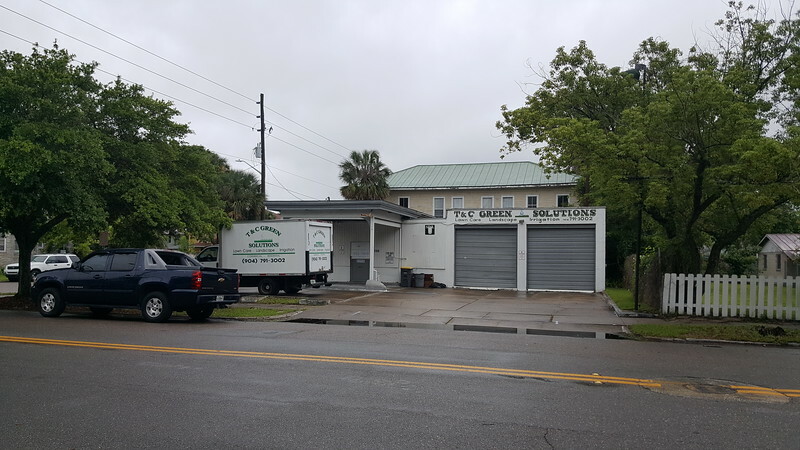 During the 1920s, Jacksonville became one of the first cities in Florida to implement a zoning code. This act laid the foundation for the development of linear commercial districts radiating out from the downtown core. In many instances, these commercial corridors were busy streetcar routes. 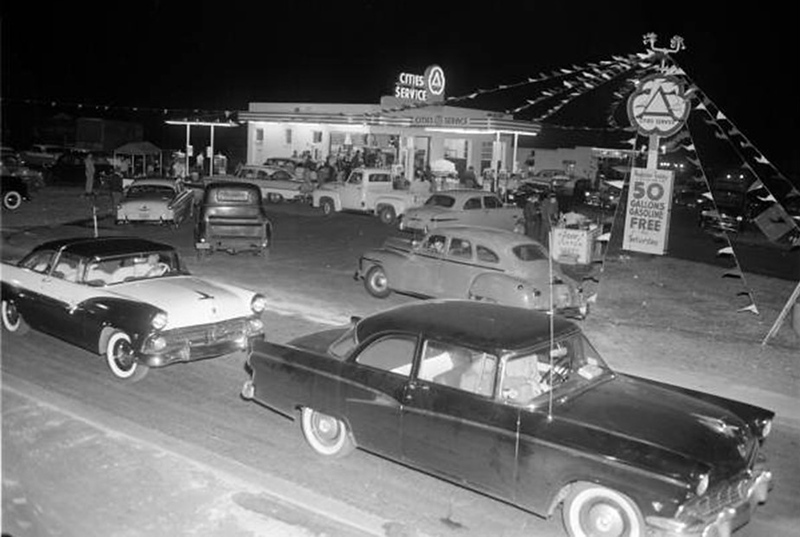 With the proliferation of gas stations opening in residential areas, some chains began to experiment with House-Type stations to better fit into the communities they served. The Dan W. Copelan Filling Station opened at 2951 Post Street in Riverside in 1935, using an English Cottage style House-Type station that was originally designed for the Ohio-based Pure Oil Company by self-trained architect Carl A. Peterson. The general thought behind the concept was to create a safe, efficient gas station that even the neighbors could love. 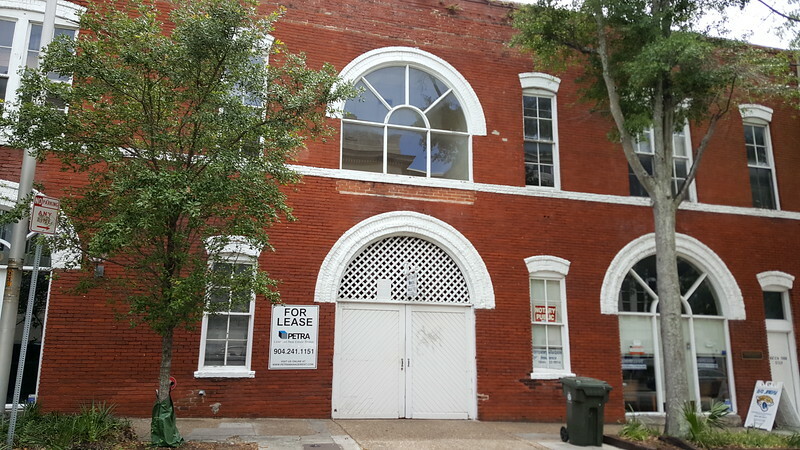 2525 Liberty Street in May 2018. Two years later, Sidney P. Claxton opened a filling station at 2525 Liberty Street using a similar Pure Oil Company House-Type design in New Springfield. Carl Peterson’s cottage style filling stations continued to be built into the 1950s. Station owners also began to experiment with Programmatic designs where their structures assumed various shapes and elements seeking to appeal to the curiosity of the passing motorist. 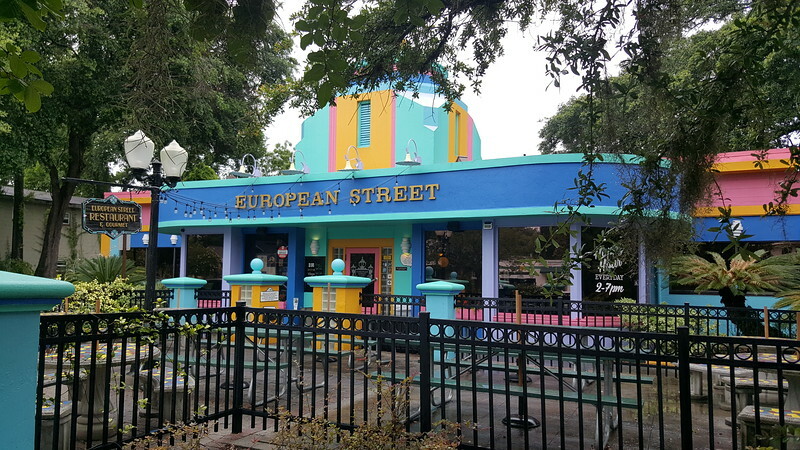 Now occupied by the European Street Cafe, 2735 Park Street in Riverside originally opened as a Programmatic-style station for the Orange State Oil Company in 1941. At the time, the Buck Rodgers series had become popular, leading to this station being designed to look like an Art Deco/Art Moderne style spaceship. By the early 1930s, many chains had began to incorporate simply Box-Type Station designs as a form of architectural standardization where customers could easily associate a design with a particular brand. Easy to replicate, the Shell Oil Company was one of the early chains to use Box-Type Stations, including this former company example constructed at 1602 Pearl Street in Springfield in 1931. The Shell Oil Company opened this box-type station at 1602 Pearl Street in Springfield in 1931. 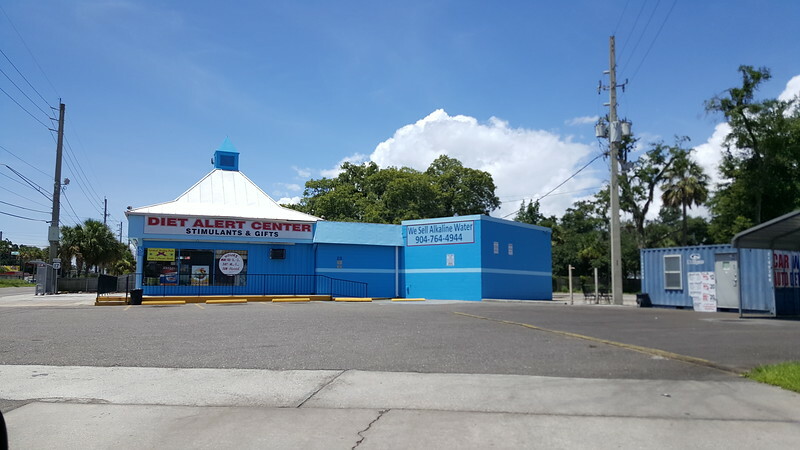 The Diet Alert Center at 6620 North Main Street in Panama Park was originally a Padgett’s 66 Service Station. In 1936, automobile industry fever led to the replacement of Jacksonville’s streetcar system with buses, which were considered by transit leaders of the era to be more trendy, flexible, and efficient. Following the end of World War II, new highways designed specifically for motorized vehicles began to dominate and alter the city’s development pattern. Following the traffic, new gas stations began to sprout up along busy corridors like North Main Street. To distinguish themselves from their competitors, many enhanced the Box-Type Station concept by incorporating contemporary design trends of the mid-20th century. This gas station design style became known as the Stylized Box. 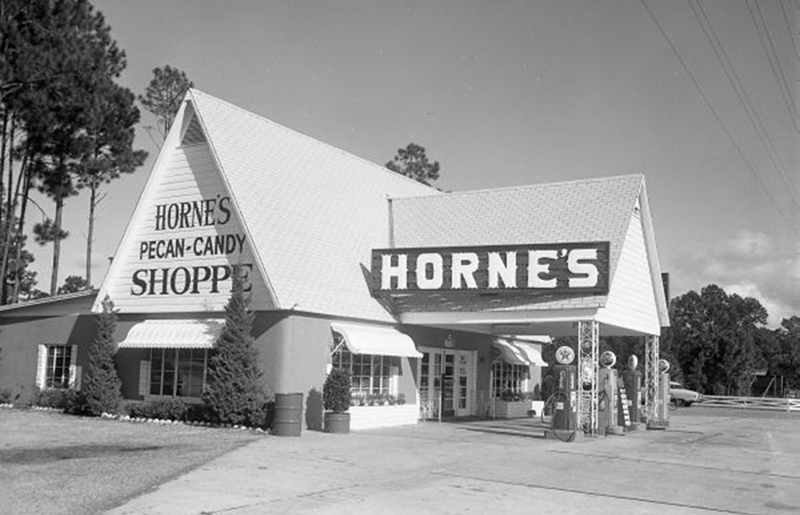 In 1959, Manchester M. Padgett of Fernandina Beach opened a Stylized-Box concept called Padgett’s 66 Service Station at 6620 North Main Street in Panama Park.